File Of Life Is For Real! – Independence Through Connections. File of Life is a small, yet crucial bit of information to keep handy in your home. Inside this bright red magnetic pocket is your personal and medical data as well as emergency contacts. Many emergency responders know to look for the File of Life in the home, and when they find it they can get the information they need to take the best care of you in an emergency. You can learn more about File of Life here, and get your free File from the SAIL office. 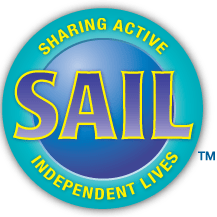 SAIL member Sue Goldstein recently had a medical emergency and realized just how important the File of Life was to her safety and health. She shared this story with SAIL. “A few weeks ago, I was in my garage ready to leave when I had a medical emergency. I ran back into the kitchen and tried to stop the blood from gushing from my nose. When after about fifteen minutes I couldn’t get it to even slow down, I called 911. (Fortunately my garage and kitchen door were still open). While one of the medics attended to me, the other grabbed the File of Life off my refrigerator, where it has been now for years (and updated as needed). I was in no condition to answer any questions and he indicated that it was a good thing I had that file. He had all the information he needed. To get your file, contact the SAIL office at 608-230-4321 or stop by during business hours! Click here to learn more about File of Life, see what it looks like, and order it in various forms. ‹ PreviousStaying safe during travel season! Next ›Is It A Drug Or A Disease?